Audiences will get an earful (or two) of one Brit’s opinions of the film industry on Sunday when Ricky Gervais returns to host the Golden Globes, though most of the actual attendees will probably be too drunk to register his barbs. But before we get to that night of inebriated adulation, we have the announcement of the BAFTA nominations which, though a slightly more restrained affair, is no less prestigious. Carol and Bridge Of Spies lead the race with nine nominations apiece and will battle it out for Best Film, Best Director, and Best Cinematography. 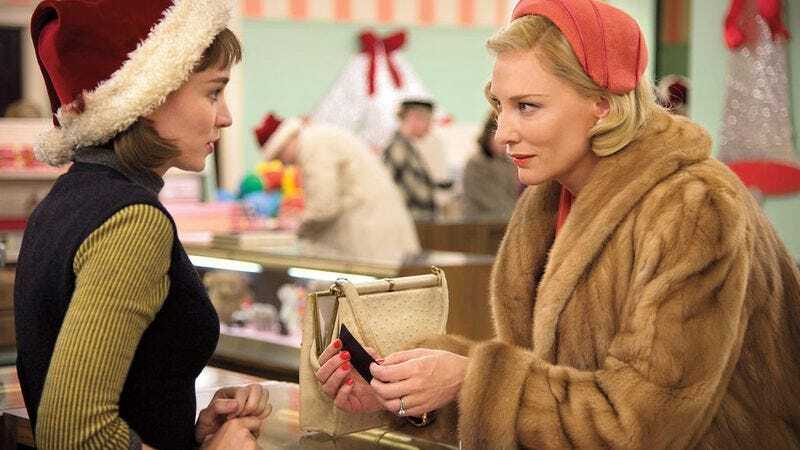 Cate Blanchett and Rooney Mara, who were deemed co-leads in Carol by the Hollywood Foreign Press and will therefore compete against each other for Best Actress at the Golden Globes, were nominated in separate BAFTA acting categories. Blanchett is up against Brie Larson, Saoirse Ronan, Maggie Smith, and Alicia Vikander for Best Actress, while Mara has been nominated for Best Supporting Actress along with Kate Winslet, Jennifer Jason Leigh, Julie Walters, and…Alicia Vikander. Yes, it seems Vikander has the distinction of being the only actress nominated in both categories this year, for her performances in The Danish Girl and Ex Machina. The Revenant nabbed eight nominations, including a Best Actor nom for Leonardo DiCaprio who, let’s not forget, slept in an animal carcass during filming. The film’s cinematographer, Emmanuel Lubezki, was nominated for his third consecutive BAFTA award, and considering he won the last two times he was up for the prize, he’s considered stiff competition for even veteran cinematographer Roger Deakins (Sicario), who’s won three BAFTA awards himself. The Revenant is also up for Best Film, despite the fact that its hellish journey is a one-way trip. National Board Of Review winner Mad Max: Fury Road continues to make plenty of (figurative) noise during awards season, earning seven BAFTA nominations, though they’re mostly in the production/technical categories. The Martian and Brooklyn share fourth place with six nominations each, and the leads of both films are nominated in their respective Best Acting categories. And in case you were wondering, Star Wars: Episode VII—The Force Awakens was nominated in four categories including, naturally, special visual effects. Below are the nominees in the top categories, but you can see the complete list here. The winners will be announced on February 14.